Western geomancy, as a whole, can often be described as astrological. This isn’t to say that geomancy comes from astrology or vice versa (although some authors might disagree, like Cornelius Agrippa), but that many of the techniques described by Western geomantic texts are heavily influenced by astrological techniques: the use of the 12 houses, perfection, planetary and zodiacal affinities, the Parts of Spirit and Fortune, and the like. The use of astrologesque techniques in geomancy have sometimes led geomancy to be called “astrology’s little sister” (since it can easily look like a shortened or abbreviated form of astrology) or “poor man’s astrology” (since it didn’t take nearly as much education or expertise to learn geomancy). For people who want to get away from astrology, it can sometimes be irksome that there appears to be so much of it in what should be the divination system that counters it (reading the stars versus divining the earth, if we want to take things literally). I assume you, dear reader, already understand the gist of how to make a geomancy chart, so the above diagram shouldn’t be too surprising. We have the four Mothers in the upper right, the four Daughters in the upper left, the Nieces formed from pairs of the Mothers or Daughters, the Witnesses formed from pairs of the Nieces, and the Judge formed from the Witnesses. The Sentence, which isn’t pictured in the above image, would be formed from the Judge and First Mother. This is how geomantic charts are formed in European geomancy as they are in Arabic geomancy and in many forms of Indian and African geomancy; the form really doesn’t change. Once you get the four Mother figures, you already have the other 12 figures implicit within them; the Shield Chart is just the full expansion of those figures to make all sixteen figures explicit. The problem, however, in using the Shield Chart is that most people just…don’t. 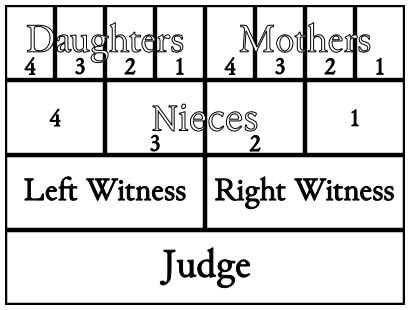 As I mentioned before, probably the most important part of a geomantic reading can be found only by use of the Shield Chart, which is the four figures of the Court: Right Witness, Left Witness, Judge, and Sentence. Of these, the Judge is the most important figure which is the answer. I’m not kidding or being obtuse here; the Judge really does answer the query, but in a very high-level, broad, context-setting way. The entire rest of the chart was developed for a reason, and that’s to give the details to fill in the gaps and clarify the blurriness that the Judge leaves behind. However, many geomancers (I flinch to say “most” even though that’s probably the case) tend to skip the Court and the Judge and go right to the House Chart, which reorganizes the Mothers, Daughters, and Nieces into the 12 houses of an astrological horoscope. To be fair, this is an excellent way to do geomantic readings, but it’s far from the only way. After all, there are more ways to read the Shield Chart than for the Court alone. First Triad: the querent’s current self, circumstances, and nature. Second Triad: the current situation inquired about. Third Triad: places and surroundings of the querent, including the people and activities involved there. Fourth Triad: people involved with the querent’s life, including their friends, colleagues, coworkers, and the interplay of the relationships among them. Interactive reading: Right parent + Left parent = Child. How things interact based on the querent’s side of things (right) when faced with the quesited’s side of things (left), or how things known (right) interact with things unknown (left). Temporal reading: Right parent → Child → Left parent. How things proceed from the past leading up to the present (right), the present situation (child), and the future leading on from the present situation (left). De Triplicitatibus ſeu de dijudicatione quæſtionis per Triplicitates, hoc eſt, per tres figuras ſimul ſine ſpecificatione alicujus figura. Prima Triplicitas ſignificat petitorem, & totam locorum circumſtantiam, ſcilicet complexionem quantitatem, cogitationem, mores, ſubſtantiam, virtutes, quae Triplicitatis illius figura denotat, prout demonſtratur in exemplo ſequenti, ubi homo est magniloquus, multarum divitiarum & complexionis frigidæ ac ſiccæ. Secunda Triplicitas ſignificat omne illud, quod prima, excepto eo ſolo, quod prima denotat principium rerum, & ſecunda fortunas earum. Tertia Triplicitas ſignificat qualitatem loci, ubi homines frequentant, videlicet an ſit magnus vel parvus, pulcher vel deformis, & ſic in cæteris, ſecundum figuras, quæ ibi reperiuntur: Significat etiam damnum loci, item, qualis ſit homo, an bonus vel malus, audax vel timidus. Quarta Triplicitas significat fortunam & staturis amicorum, & principaliores curiæ, ac homines officiarios. On the Triplicities, or on the decision of the question by the Triplicities, which is by three figures at the same time without the particular mention of another figure. The first Triplicity signifies the querent and all of the circumstances of [their] place, as one may know the complexion, magnitude, thoughts, mores, substance, virtues which of this Triplicity the figure denotes, just as is demonstrated in the following example, where a man is boastful, greatly rich, and of a cold and dry complexion. The second Triplicity signifies all that the first does, with the sole exception that the first denotes the principle of the thing, and the second its fortune. The third Triplicity signifies the quality of the place where people frequent, as one may see whether one be great or small, beautiful or deformed, and so forth, according to the figures that are found there. It also signifies damage of the place, likewise what sort of person it may be, whether good or evil, brave or timid. The fourth Triplicity signifies the fortune and stature of friends, and principals of the court, and officers. This is certainly a different take on the triads than what John Michael Greer has in his book, and I wonder where JMG got his information on the triads from, because Fludd seems to have a different way of interpreting them. That said, you can kinda see how JMG got to his interpretation from Fludd’s. Annoyingly, however, despite the nearly 650 pages of information in Fludd’s masterwork of geomancy, all I can find on the triads is simply this one page of information. Like I said, the bulk of Western geomantic lore focuses on the use of the House Chart, and Fludd is no exception. Still, at least the triads give us something to work with so that we have some way of interpreting the Mothers, Daughters, and Nieces in the chart besides the Via Puncti (which is a very good way to interpret other aspects of the Shield Chart). Between the condition of the querent (First Triad), condition of the quesited (Second Triad), the place of the query (Third Triad), and the people involved in the query (Fourth Triad), we have about as much information as we’d get from the House Chart but presented in a different way. This will help us base further techniques of interpreting the Shield Chart later, as I have a few ideas I want to flesh out in the meantime in how we might expand on the Shield Chart itself apart from the House Chart. Also, there’s something I want to warn you, dear reader. Now that we know what the “houses” of the Shield Chart are associated with (such as the First Mother with the condition of the querent), it might be thought that we can draw associations between the Shield Chart houses with the House Chart houses, such that Shield Chart houses 7, 8, and 12 (Fourth Triad) relate to the seventh, eighth, and twelfth houses of the House Chart. While this might be a useful meditation exercise, be aware that there are multiple ways of assigning the figures from the Shield Chart to the House Chart. I tend to stick with the straightforward traditional way (First Mother to first house, Second Mother to second house, etc. ), but there are at least two other ways I’ve seen it done: the “esoteric” way (assign the Mothers to the cardinal houses clockwise starting in house I, Daughters to succedent houses starting in house II, and Nieces to cadent houses starting in house III) and the Golden Dawn way (same as esoteric but starting in house X/XI/XII). So, maybe this line of inquiry and meditation might not be the most useful thing to rely upon, especially since the whole point of this is to keep the astrological geomancy techniques separate from the geomantic geomancy techniques. The technique exposed by John Michael Greer is a misunderstanding of the traditional astological trinities of fire, earth, air and water mentioned above. Interpreting the triplicities within the theme still is possible, but does not correspond to anything else than the native meaning of the involved houses. That’s an interesting claim, but looking at Fludd again myself, I’m not sure where to validate or support that. What chapter of Fludd are you looking at? Hello. I have been reading two different (French) editions of Robert Fludd’s Theory of Geomancy translated by PV Piobb. And in both editions you can notice that the triplicities are based on astrological data. Plus if you study JMG interpretation, it appears to be quite close to classical astrological trinities with some minor differences, each trinity being influenced by an angular house conditioning its overall meaning. With that being said, I still like to interprete “the geomancitc triplicities”, each as a “mini-theme” carrying a fragment of the oracular message. For example, a consultant recently asked me about the chances he had to sell his house before the end of the year. Analysing the eight triplicities composing the theme, I managed to elucidate the question. An irresolute and hesitant buyer (Puella VII, Third Daughter) + Whose financial resources are doubtful or long to wait (Via VIII, Fourth Daughter) = Causes anger to the Consultant, revolted by the situation (Rubeus XII, Fourth Niece). Proceeding this way, I can extract some always very insightful messages from the theme, which compose some kinds of Haïkus full of meaning. I like the “gamification” side of this technique, pretty intuitive, pretty close to a storytelling way of reading the shield. Well-done, I like the exceptional way you clearly separated astrology from geomancy but Christopher cattan showed in his book that astrology will help in given more clear easy and precise answers to geomantic charts.